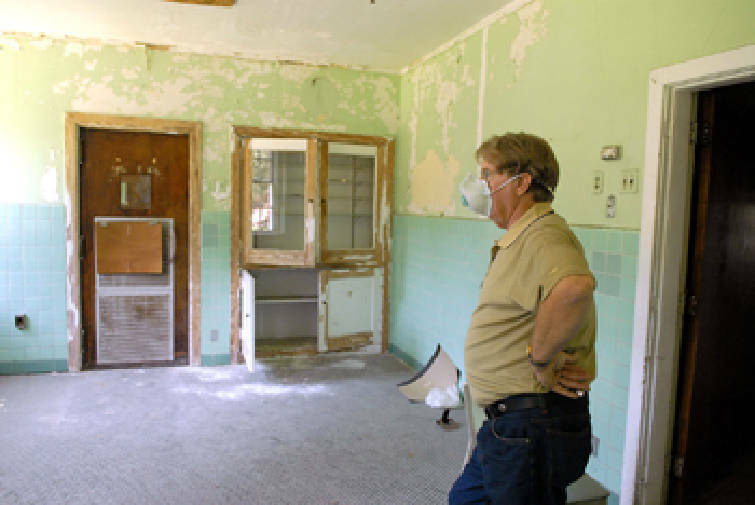 Staff photo by John Rawlston/Chattanooga Times Free Press - Sep 2, 2010 Trion Mayor Johnny Ingle shows the inside of the old Trion Hospital. The city is trying to decide what to do with the old building. A 76-year-old Trion, Ga., hospital building listed on the National Register of Historic places soon could meet a wrecking ball. For 40 years, Riegel Community Hospital provided medical care for Trion residents and workers at the local denim mill. But the building lies in a flood plain and now is beyond repair, city leaders said. They are asking for bids to demolish the building. Mayor Johnny Ingle said the former hospital, which shut its doors in March 1975, has a bad roof and was damaged by flooding last fall. "It's in bad shape, and we can't keep putting money in it," Ingle said. But even demolition could be a pricey option. The structure was packed with asbestos when built and the inside is coated with lead paint, he said. If bids come in too high, the city might just let the building sit. "It all depends on how the bids come in or if we can afford to tear it down or not," Ingle said. Contractors have until Sept. 23 to submit written bids, according to a recent legal advertisement. Records show the hospital was built by the Trion Manufacturing Co., the local mill. It was named after Benjamin Riegel, longtime president of the mill, and donated to the city in the 1990s. Trion residents now can receive care at Hutcheson Medical Center in Fort Oglethorpe and Floyd Medical Center in Rome, Ga., said David Starkey, who lives in a house built on what used to be the hospital's parking lot. "I'd hate to see it go," said Starkey, 82. "It's been there for so long." His wife was a secretary there, and he has several pieces of hospital memorabilia, including two bedpans and a fire extinguisher. Riegel is one of seven town hospitals listed as historic in Georgia, according to National Registry documents. The listing means no federal or state money can be used to tear down the building. Ingle said an Atlanta company contacted the city about renovating the structure recently, but he's not sure it's a smart investment because of the potential for flooding. "Anything we put into it could be ruined if there was a flood," Ingle said. The property would be ideal for a city park, he said, but discussions about how to use the land are pretty open right now. Starkey said he wouldn't mind seeing a park on the site. "I haven't heard many people talking about it being torn down, but I guess if a park went in there, and it got the kids off the street, that would be a good idea," Starkey said.